At least once a year I treat myself to an alfresco long-table dinner. If you like the freshest ingredients prepared in new ways and enjoyed with friends in a magical place, you should book a place at the table too. You will discover new tastes, get to know your tablemates and learn first-hand about what makes a particular place special. Joy Road Catering, in partnership with God’s Mountain Estate, offers this experience and it is worth the trouble to seek it out. When Jessica rings the dinner bell, diners are assigned seats at one long table overlooking Skaha Lake south of Penticton. It feels like a movie set from a dreamy Italian film about a family gathering. One long table is set in perfect symmetry and the smell of ripening apples is in the air. Just over the steep hill toward the lake is the estate’s Riesling vineyard. 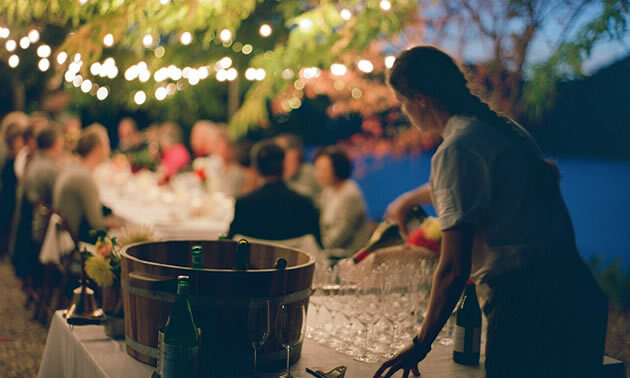 You have already had a sip of chilled bubbly in the shade of trees, met a few of your fellow dinner guests and maybe had a peek at the just-printed menus. The menu is a chef-curated collection of fruits, flowers and vegetables picked at their peak to be served alongside house-made charcuterie and wet-cured, hot-smoked, hay-baked Berkshire Ham that will melt in your mouth. The whole evening is designed to be a lovely surprise. The menu isn’t finalized until a day ahead; your seat is assigned moments before service begins. An early delight was a wooden plank that covered the table centre, stacked with Joy Road’s own charcuterie and enough house-made fermented and fresh vegetables to serve each group of eight. 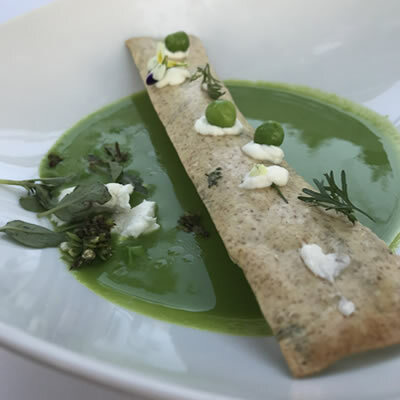 This is the first of a five-course dinner of local foods, made from ingredients at their peak and available the day before at the farmers market. The plank kicks off dinner and lively discussion among your fellow diners. 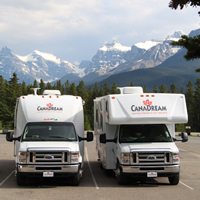 Dana Ewart and Cameron Smith are the chef-owners of Joy Road Catering, renowned for delivering family-style culinary improvisations on locally grown ingredients that reflect the range of bright and vibrant fruits and vegetables available in the Okanagan and their specific terroir. Terroir is a French word that means “from the land,” more specifically, it is the concept of how the soil, weather, sun and all of the environmental factors impact the taste of whatever you happen to be eating or drinking. Naramata Bench has a specific terroir that impacts the grapes, fruit and vegetables and even the animals raised there. With a seat at the table, you will explore and savour these subtle tastes. Just before the main course is served, in an almost reverent moment, Ewart reads from Alice Waters’s The Art of Simple Food––the part where Waters talks about the importance of developing a relationship with the growers and sellers of local sustainably grown food and knowing where your food comes from, who is overseeing the cultivation and tending of what will eventually become part of you. 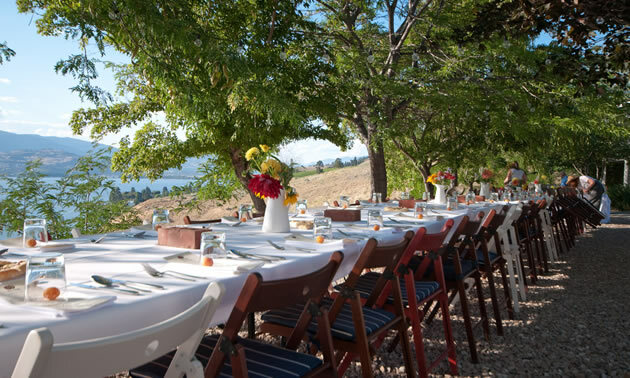 God’s Mountain Estate is a tremendous location with epic views of Skaha Lake and the Okanagan Valley––the perfect backdrop for this long-table event. Trees provide late afternoon shade of the communal table. Chef Dana chooses the freshest ingredients from local growers peak of the season. Whatever the fruit and vegetable stalls feature at the local farmers market Saturday morning will likely be centre of the plate on Sunday evening’s menu. Flower petals were featured in various courses starting with the first-course charcuterie and a single pretty violet resting on the fruit tart as rough-cut chunks of Bernard Callebaut chocolate are passed with the last cups of coffee and bright green mint tea. It is an interesting social process getting to know your tablemates’ personal passions and moving stories of difficulties overcome. You can find Joy Road Catering’s breads and other goodies at the farmers market in Penticton, if you are there early. Look at the market for the weekly gallette, a great example of local peak fruit baked into a delicious pastry. 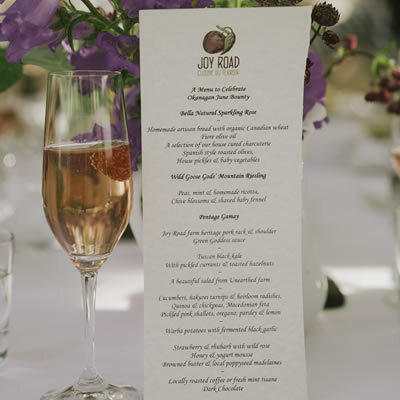 Check out Joy Road’s seasonal events and treat yourself to a one-of-a-kind culinary adventure: a long-table, alfresco feast among new friends. Joy Road sells her delicacies at the Penticton Farmers' Market.